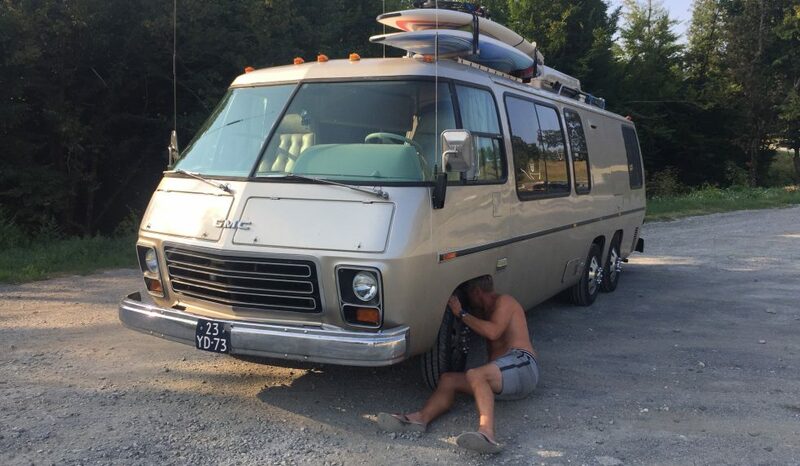 For our two daughters (meanwhile 14 and 16 years old), we try to make our camper trips a bit more exiting as they are now, hmm.., so I thought lets bring a few windsurf boards + gear with us. Like good old times. If they do not like it, it looks good as display and I will certainly love it myself. How do you place a roof rack on a roof that you don’t want to penetrate on multiple spots with a drill? Still have nightmares from the water issues in the past….. The answer is….glue it. First I had my thoughts. Glueing Aluminum U-profiles on a painted roof. It sounds ridiculous. So I got hold on this tape called 3M Fusion Tape and did some pulling tests and found out that this stuff promised what it said. However I combined it with SikaFlex glue, just in case. Make sure you work very secure and grease free. I used 2 U-profiles and drilled holes in them to bolt side bars on them. Then I placed 3 stripes of tape + glue on the profiles and mounted them on the Aluminum roof part. The U openings pointed to each other. After one day I installed the side bars and the rack is ready for use. Previous Drawers were ever there is a space!